Transportation defines Portland. 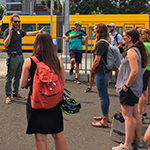 Portland State University (PSU), our urban university, shapes the transportation professionals who, in turn, shape their city and cities across the world. Our students conduct cutting-edge research under the guidance of the world’s foremost transportation research faculty at PSU - from both the (CUPA) Toulan School of Urban Studies & Planning as well as the department of (MCECS) Civil & Environmental Engineering. Students work on real projects with partners in our community—the organizations helping to make our transportation system work for all users. These partnerships lead to internships and rewarding careers after graduation. Wherever you see transportation innovations in urban centers, you’ll find PSU students and alumni. Portland State boasts the U.S. Department of Transportation’s national center for livable communities, the National Institute for Transportation and Communities (NITC), which funds millions of dollars of transportation research and education, with vital contributions from student researchers working alongside faculty members. This research finds its way into the hands of transportation professionals at all levels, establishing the authority of our students before they even complete a degree. NITC also supports the student group which bridges gaps between disciplines with educational and entertaining events, speakers and trips. Each year, 15–30 graduate students from engineering, urban studies & planning, and other fields work as graduate research assistants for faculty. These students are often co-authors on project final reports and journal articles. TREC hires undergraduate student workers as well, who may work at processing data or similar tasks. Learn more about the assistantships at College of Urban and Public Affairs (CUPA): Graduate Student Financial Resources. TREC and the transportation faculty at PSU are awarding National Institute for Transportation & Communities (NITC) Scholar fellowship funds to current PSU students in transportation. Awards will be $1000-$3000 and will be made during Spring 2019. Students who received NITC Scholar funding in past years are eligible. Due to federal funding limitations, awards for students who are not U.S. citizens or permanent residents will be in the form of domestic travel funds to attend a transportation or professional development conference. If you are selected as a NITC Scholar, you will be expected to actively participate in TREC- and NITC-sponsored activities on campus, such as STEP and attending the Friday Transportation Seminars on a regular basis. To apply, complete this form by March 5, 2019. Dr. Walter H. Kramer founded the first transportation studies center in the Department of Marketing (now School of Business Administration). Focusing on transportation research and education, Dr. Kramer believed that "the actions of an individual, of a college, can determine the future of our cities, our society," and devoted himself toward bringing "the resources of the faculty to bear on the problems of the community." This fellowship is aimed at providing financial support to PSU graduate students enrolled in transportation-related graduate programs and working on multi-disciplinary, multi-modal research connected with making a difference in "our cities, our society, and the community." Learn more. The Initiative for Bicycle and Pedestrian Innovation (IBPI) at Portland State University (PSU) is awarding a $2,500 scholarship to a PSU graduate student who is highly motivated to focus their studies on bicycling and walking as mainstream forms of transportation. The successful applicant will be seeking to better understand how communities integrate bicycling and walking through their planning and design processes. The selected student also will be invited to work as a paid intern at Alta Planning + Design to obtain hands-on experience in active transportation. Learn more. 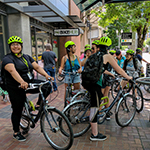 The Initiative for Bicycle and Pedestrian Innovation (IBPI) at Portland State University (PSU) is awarding a $4,000 scholarship to a PSU graduate student who is highly motivated to focus their studies on bicycling and walking as mainstream forms of transportation. The successful applicant will be seeking to better understand how communities integrate bicycling and walking through their planning and design processes. Learn more. Metro Councilor Rex Burkholder and wife Lydia Rich believe that the future sustainability and health of our communities depends upon providing alternatives to motor vehicle transportation, including bicycling and walking. The Burkholder/Rich Scholarship aims to foster the best and brightest students who will be shaping that future. Portland and Oregon are widely recognized for policies and programs to promote bicycling and walking. Continuing that tradition, transferring that experience to other areas, and, most importantly, advancing the practice even further will require enlightened professionals. The Burkholder/Rich scholarship will support a graduate student who intends to be active in developing a future where bicyclists and pedestrians play a major role in the livability of urban areas. Learn more. Through the on-campus Students in Transportation Engineering & Planning (ITE-STEP), students can take on leadership roles in cultivating community and education around the transportation issues important to them. Through local chapters of professional development organizations like WTS Portland and Young Professionals in Transportation (YPT), students can develop their academic and professional lives through forging relationships between transportation students and professionals. With the help of NITC funding, we send 15 - 20 PSU students to attend the annual meeting of TRB each January. Many of our graduate students present research at the conference. Alta Planning + Design, SERA Architects, CH2M, Kittelson & Associates, Inc., Lancaster Engineering, Nelson\Nygaard, Oregon Public Health Institute, DKS Associates, Resource Systems Group, Inc., Fregonese Associates and ICLEI. Our doctoral alums are working as researchers, consultants and faculty members in places such as: University of Arizona, University of British Columbia, McGill University and the University of Sydney. Transportation problems don’t stay between the lines. As a transportation student at Portland State University, you’ll work with experts in every field that contributes to our knowledge of transportation, including engineering and planning but also fields such as environmental science, psychology, geography and computer science. Our core transportation faculty, including Jennifer Dill, Christopher Monsere, Kelly Clifton, Miguel Figliozzi, Jenny Liu, Aaron Golub, Avi Unnikrishnan and Liming Wang, are regarded as national and international experts in their fields. Portland State offers a wide variety of degree programs suited to the multi-disciplinary demands of a career in transportation. We offer undergraduate programs in civil engineering, supply and logistics management, and community development, which lay the foundation for our transportation graduate programs. Master of Urban and Regional Planning and Master of Engineering in Civil and Environmental Engineering, put you on track for careers shaping the future of transportation with local governments, consulting firms and other organizations. The Master of Science in Civil and Environmental Engineering and the Master of Urban Studies, are suited for those seeking careers in a broad range of transportation professions or in academia. For those seeking a degree rooted in both transportation planning and engineering, we offer a Dual Master’s Degree Program in Transportation, allowing students to obtain a Master of Urban and Regional Planning and Master of Science in Civil Engineering at the same time. The two disciplines also collaborate to offer a Graduate Certificate in Transportation for established professionals looking for a deeper understanding of transportation disciplines. Our Ph.D. in Civil and Environmental Engineering and the Ph.D. in Urban Studies, help shape researchers into the top experts in their fields. Portland State students publish as lead authors at a greater rate than most universities and are disproportionately represented at forums including the annual meeting of the Transportation Research Board of the National Academies. An overview of transportation-focused courses provided by Portland State University. Transportation workforce development doesn't always take place at the university level. Students' interest in transportation can start much earlier than that, which is why we are always looking for ways to engage elementary and high school students in transportation. In recent years, STEM (Science, Technology, Engineering and Mathematics) education efforts at the K-12 level have increased significantly and many organizations are seeking to expand the capacity and diversity of the STEM workforce. Through nationally-funded research, we support curriculum development projects and initiatives that introduce middle- and high-school students to transportation concepts and careers. Women comprise 50% of the workforce, but are only represented in 15% of the transportation industry. We seek to increase the number of women and students of color in transportation-focused degree programs, and expand the diversity and capacity of the workforce. Events and workshops that are designed for specific age groups and deep-dive into aspects of the transportation industry. Presentations for students interested in learning about careers in transportation. Library of Innovative Curriculum that offers educators tools to teach their students concepts in transportation. Mapping and spatial analysis has been evolving as an important field of study for centuries. In contemporary times, we refer to it as “GIS”, which stands for Geographic Information Science. 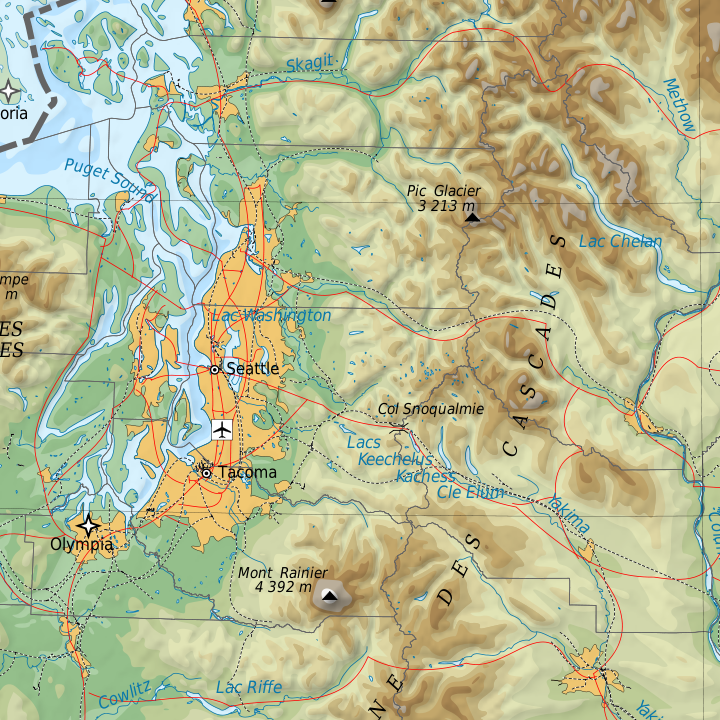 Join us at this one-day workshop for high school girls to become familiar with creating and interpreting maps and doing spatial analysis, by working with vehicle crash data from the City of Portland. Students will get to make their own interactive web maps using data from their city and neighborhoods. APPLY TO ATTEND: Applications for this camp have closed. Be notified when 2020 applications open. This one-week residence camp offers any student entering the 9–12 grade an immersive introduction to the workings of the Portland transportation system. Half of each day is spent in the classroom hearing from PSU faculty and guest lecturers from ODOT, the FHWA, the Portland Bureau of Transportation, TriMet, the Port of Portland, and various other public and private transportation agencies that operate in the Portland metro area. The other half is spent outside, in field tours of Portland’s transportation infrastructure and public spaces. This one-week residence camp offers any student entering the 9–12 grade who identifies as female an immersive introduction to transportation systems and engineering. Half of each day is spent as a seminar, in the classroom hearing from Oregon Tech faculty and guest lecturers from Blue Zones Project, the Basin Transit Service, the Klamath County Public Works, City of Klamath Falls, and various other public and private transportation agencies that operate in the Klamath Basin area. The other half is spent outside, in field tours of area transportation infrastructure and public spaces. Maps have been used for centuries to help humans understand our world. In contemporary times, we use a mapping technology known as “GIS”, which stands for Geographic Information Science. GIS is rooted in the science of geography, and uses many of the same skills of ancient map makers, now enhanced by the use of state of the art digital technology and software. 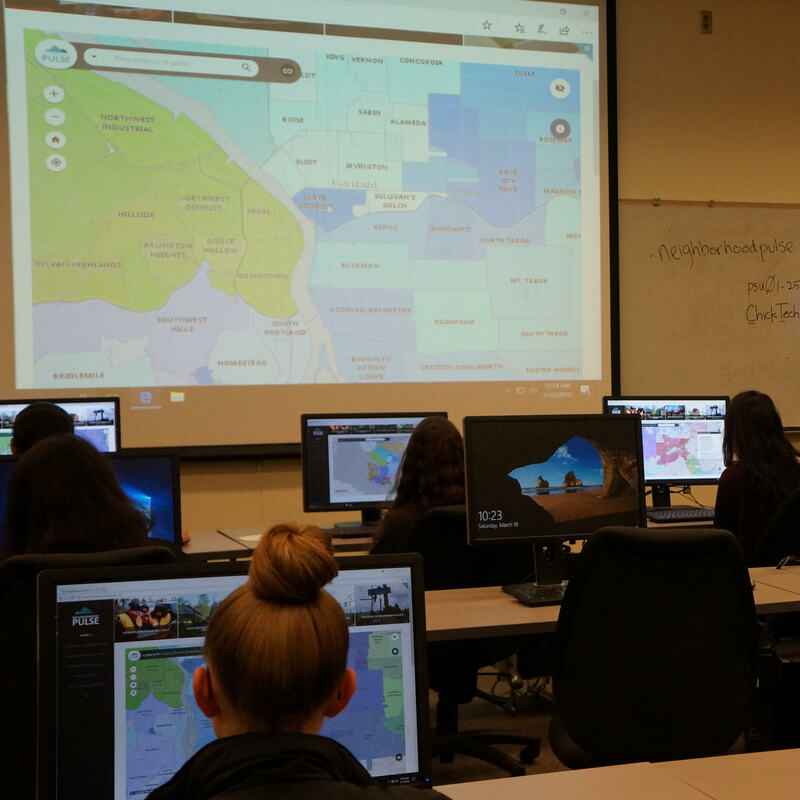 Join us at this one-week day camp for high school girls to become familiar with GIS by creating and interpreting maps and doing spatial analysis, using data from the City of Portland to visualize some compelling urban transportation issues. 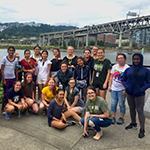 This one-week residence camp offers any student entering the 9–12 grade who identifies as female an immersive introduction to the workings of the Portland transportation system. Half of each day is spent in the classroom hearing from PSU faculty and guest lecturers from ODOT, the FHWA, the Portland Bureau of Transportation, TriMet, the Port of Portland, and various other public and private transportation agencies that operate in the Portland metro area. The other half is spent outside, in field tours of Portland’s transportation infrastructure and public spaces. Have a group of students curious about careers in transportation? Contact us at asktrec@pdx.edu and our staff can introduce your students to the industry, the variety of careers, and its importance as a fundamental aspect of human society. Through national funding from the U.S DOT, our university consoritum NITC funds education grants at six universities. These projects result in creating a library of curriculum that furthers the K-12 body of resources for teaching transportation in the classroom.